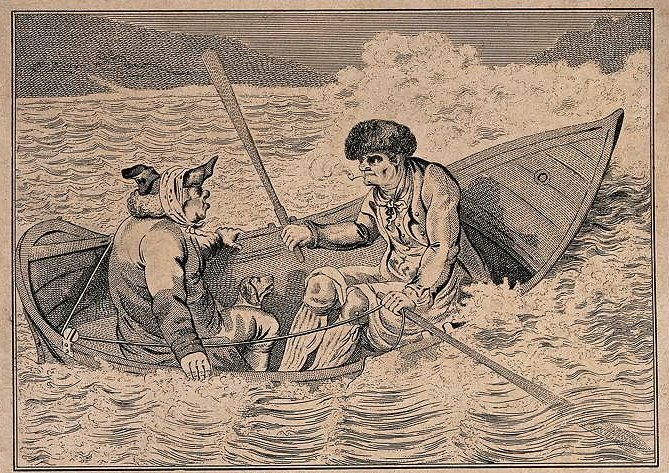 Two men in a boat on a stormy sea. 1803 etching. Courtesy Wellcome Library, London. Wellcome Images. Do an internet search for self-directed IRA and you’ll find a number of promoters promising to give you complete control over your retirement accounts. Those promises may contain a grain of truth, but don’t let exaggerated claims capsize your retirement plan. It is true that by rolling over an existing IRA or 401(k) into a self-directed IRA, you can invest in assets not offered by most IRA providers. With a self-directed IRA, you can buy almost any type of asset: an interest in a start-up, a parcel of real estate, a patent, or precious metals. It’s also true that you can continue to defer tax on gains within the IRA. However, the rules governing self-directed IRAs contain important restrictions that you should understand before you set one up—make one wrong move and you could be looking at some serious tax consequences. In order to establish a self-directed IRA, a qualified custodian must be used to hold the IRA assets, maintain records, file reports, and process transactions. The custodian must be a bank or an IRS approved non-bank trustee. (The IRS publishes a list of approved non-bank trustees on its website, available at http://www.irs.gov/Retirement-Plans/Approved-Nonbank-Trustees-and-Custodians). The role of the self-directed IRA custodian differs substantially from the role of conventional IRA custodians. The self-directed IRA custodian generally will not provide investment or tax advice, will not sell or recommend investment products, and will not perform due diligence to determine the suitability of any investments. The self-directed IRA account owner chooses where to invest and directs the custodian to execute each transaction. Given the limited role of IRA custodians, the burden to maintain compliance with the laws and regulations that are applicable to all IRAs falls on the self-directed IRA account holder. Some of the most important requirements are found in Internal Revenue Code section 4975, which states that the IRA will lose its tax exempt status if the IRA engages in any prohibited transactions between the IRA and certain disqualified persons. allowing a disqualified person to use any income or assets of the IRA. If it’s determined that a transaction is in fact prohibited, the account will cease to be a retirement account, resulting in a deemed distribution of the IRA funds, subject to taxation at ordinary rates, and possibly a 10 percent early withdrawal penalty as well. These provisions are designed to prevent any transaction that is not at arm’s length or that otherwise has the potential to harm the plan. In other words, the IRA account holder is not allowed to obtain any benefit from the IRA assets without first paying income tax. As a matter of policy, the tax favored status of IRAs is meant to encourage retirement savings and promote investment. Once any account assets are converted to personal use, the IRA is no longer a retirement account, and the IRS will expect taxes to be paid. In some cases it won’t be entirely clear if a prohibited transaction has taken place, and the IRS may or may not decide to challenge the tax-deferred status of your IRA. The law in this area is unsettled and leaves some room for interpretation. This gives the IRS broad discretion to go after “suspicious” transactions. For example, a transaction may be prohibited even if disqualified persons are not directly involved. In one case, the United States Tax Court found that a prohibited transaction occurred when the taxpayer caused his retirement plan to lend money to three entities in which he owned a minority interest. Even though none of these entities were “disqualified persons,” the court found that the benefit to the account holder was substantial enough to violate the provisions of section 4975. See Rollins v. Comm’r, T.C. Memo 2004-260 (T.C. 2004). If you plan on using your self-directed IRA to transact business with any entity that you or any related person has an interest in, a careful analysis of the arrangement is required to ensure that it does not involve a prohibited transaction. Self-directed IRA owners must be aware of the prohibited transaction rules and other restrictions; the account custodian usually will not offer guidance as to whether a transaction is prohibited. From the perspective of the IRS, there is great potential for abuse built in to the structure of self-directed IRAs. Because taxpayers have greater control over the IRA assets and little oversight from IRA custodians, there is more opportunity for a taxpayer to benefit from the use of IRA assets without removing them from the account as part of a taxable distribution. A relatively recent development involves the use of LLCs to give an IRA account holder checkbook control over the account assets. In order to do this, the IRA purchases a majority interest in the stock of an LLC for which the IRA account holder serves as general manager and has full authority to act on behalf of the company. The Tax Court has held that because the company does not have any membership interests when the investment is made, the company cannot be a “disqualified person” with respect to that transaction. However, if the IRA account holder receives any money or other assets from the company—whether it be a salary, loan, gift, or commission—that will be considered a prohibited transaction. See Ellis v. Comm’r, T.C. Memo 2013-245 (T.C. 2013), affirmed by Ellis v. Comm’r, 787 F.3d 1213, 1215 n.4 (8th Cir. 2015). The idea of checkbook control is appealing to many investors, since it provides direct access to the IRA funds without having to go through the account custodian to execute transactions. In theory, the IRA account holder can do as he pleases and manage the day-to-day operations of a company that is wholly owned by his self-directed IRA. In practice, an IRA LLC can be extremely risky, even for sophisticated investors. There is little case law discussing the use of IRA LLCs, so investors must be wary of engaging in activities that could fall under the category of prohibited transactions. Though many online promoters will tell you that an IRA LLC provides you with unlimited investment opportunities, you’ll be hard pressed to find one that can offer a sound legal opinion to confirm that your investment plan meets the requirements of the Internal Revenue Code. These types of arrangements are on the IRS’s watch list, and more vigorous enforcement efforts could be lurking just beyond the horizon. For the more adventurous investor with sufficient time, energy, and know-how, a self-directed IRA can be a good idea. If you are interested in setting one up, or already have one in place, consult with a tax attorney who knows how to avoid prohibited transactions. As you start researching assets, your attorney can also help you evaluate the legitimacy of investments that aren’t regulated by the SEC or state securities agencies. As the captain of your self-directed IRA, you are ultimately responsible for its success or failure. If you decide to take the helm without a skilled navigator at your side, be prepared to go down with your ship.